Gama Bomb is an Irish trash metal band, witch was founded by School friends Joe McGuigan (bass) and Philly Byrne (vocals) who met up with Luke Graham in 2002. Soon, they built up a small but loyal following which they consolidated with a rigorous touring schedule and frequent forays into self-released recording. The band first gained attention with their demo entitled The Survival Option in that same year. After that these guys went on tour for what would become a very long tour for them. During this period Byrne often appeared on stage in fancy dress as a chef, priest, pirate or scientist in an increasingly colourful stage show which frequently included a Thrash Metal version of 80's TV show Teenage Mutant Ninja Turtles theme tune. Gama Bomb's first tour dates outside Ireland came in 2004, supporting punk band The Dangerfields on a tour of Scotland. So now after all these years, this band still does what it wants to do. Having fun and making good music. And that’s how the album sounds. Although I question the level of how serious these guys are as it has a humorous vibe. 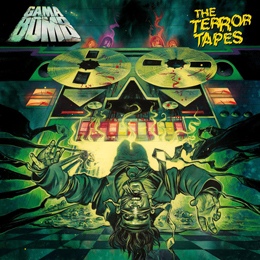 Apart from that, The Terror Tapes is good old school trash metal (but with a Jack Black vibe in the background).